It’s Friday and the end of the week. Today is my day to be home with the kids. Co-parent is taking the kids for a full weekend, so I will not see them again until Wednesday afternoon. 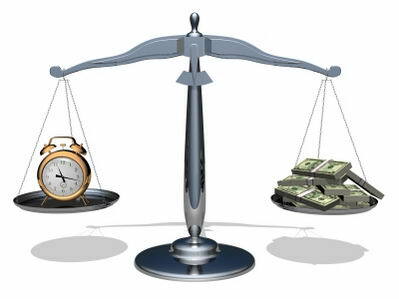 What to do between now and then? Relax and get some “me” time in, I suppose. Twin Crazy and Twin Husky are sick. So I wound up to both of them in my bed this morning. They all got ready so quickly and helped with their own breakfasts. I love this. The mornings are getting very easy with them. They love the independence and doing things for themselves. The fact that the Twins are potty trained with few accidents helps as well. They like doing the same routine as the “big kids” and I love directing all four them of them now as equals. Twin Crazy picked out her clothes and she wanted to wear a long sleeve black shirt with light jeans. She looked soooooooooooooo New York City to me. Upper East side. I was calling her my “city girl” all day today. Big Bro decided to put some finishing touches on his “house” made from an Amazon box. He wanted to draw more things to make it more like a house. He drew a garden with corn, broccoli, strawberries, and apple trees. I love the fact that he connects the garden with the concept of home. That’s meaningful for me, too. The ride was fine; we talked about fog, made a game where we had to catch up to certain cars on the highway, I sang to AC/DC for a bit, we saw Twin Crazy’s “castles” in the city and they had their lights on for the fog. I decided to “steal” Red from daycare today since it would be awhile since I saw her. She is the most emotionally needy of the four, I think. She had a great time with us. During the day she asked me if this is what we always do together while she is at daycare – if we go anywhere. I told her honestly that no, we really just hang around the house and play while I also do things around the house. She had a great time today with her siblings and me. The kids were very creative today. There was lots of cutting with scissors, coloring, and doing “paperwork”. I read to the Twins several books. Snack time was the “yogurt bar” with three different kinds of yogurt and fruit that is quickly going bad. Red got lots of time in with Cocoa. I wanted to start my “renovation” of the office to organize the kids bins of toys and redo the entire closet. While I attempted to do this they played kitchen and Red also did “work” at her desk. I played music from my Apple and danced with Twin Husky and then Twin Crazy. They love this. Or maybe I love it more. I caught Twin Crazy “reading” a stack of books outloud by herself in the backyard. She said that now since she read her books she was ready for a nap. The kids played with tricycles and scooters as I got lunch ready. They were playing follow the leader and singing songs together. Twin Husky was on a two wheeled scooter and was really good at balancing. While the Twins took naps Red was very anxious to do something “just with” me. We made a calendar together. She drew the boxes and the numbers in the boxes, cut the boxes out, and then I taped them back together in calendar format. It was a project that took awhile which was nice. It looked and felt like rain outside so we did this together in the living room with the fireplace on. I loved it. Red got more quality time with Cocoa so I think she’s feeling sufficiently loved. Hopefully enough from me and Cocoa to last her for the next several days. Co-parent picked up Big Bro from school and swung by my house to pick up the rest on their way to their weekend getaway. I was grateful for two drives back and forth that I did not have to do. I am in relaxation mode now. After they left I slept for 2 hours. I did not sleep well the past few nights because of sick kids. This weekend will be a lot of time alone for me. I’m struggling with what to do. Maybe I’ll go to the movies along with house stuff – I need to venture out of this house and throw myself out there. I’m ready for that. I woke up early and continued laundry; the kids were up so I grabbed all the sheets for the last load of the week. I love the smell of fabric softener. I find it comforting. All kids were up and sitting across on the couch getting ready for some T.V. Thankfully, Big Bro did not buy any movies. I still can’t believe he knows how to do this now. 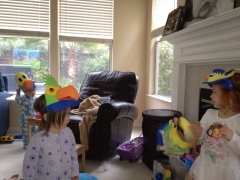 Then 3 of the kids broke out the funny animal hats and started playing with each other and pretending they were birds, dogs, ducks…. so cute. I made a huge pancake breakfast; got the kids dressed; played a bit. I took Big Bro and Red out for the morning. We just did some shopping – Big Bro needed some shoes and I needed a laundry bag. Both kids were GREAT with these activities. Big Bro originally wanted shoes with pictures on them or ones that lit up, but he’s in a size now for bigger kids and the shoes don’t really have those styles. He picked out a decent pair of black and bright yellow sneakers. He likes them. They both helped me at Bed Bath and Beyond for a laundry bag, and even saved me money since they both picked the cheapest one. I’m watching what I’m spending like a hawk now since I have to. I never thought I would go backwards in my standard of living but now it is inevitable so I’m changing behaviors definitely now. At home, all kids were re-united and Big Bro initiated an activity for them all. 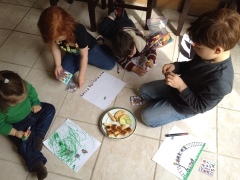 He brought out markers and stickers and paper and had everyone on the floor creating art. I loved watching them and thought it was great that Big Bro took the initiative like that and that they were all sharing stickers and helping each other with caps, pulling the stickers off the sheets, etc. Made lunch at home; kids napped in clean sheets. They woke up and I gave them baths and showers. I love the smell and feel of clean kids. I love how they cuddle up to you. I cut 80 fingernails and toenails, my weekly ritual. 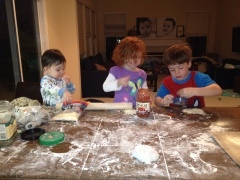 I made home-made pizza for them for dinner – Trader Joe’s has pre-made doughs that I keep in the freezer. Afterwards we had ice-cream. And watched TV. Big Bro played a Spongebob 2x since I didn’t watch it with him appropriately the first time. He really notices if I am watching it with him. He likes to do things with me and if I am distracted even sitting next to him is not good enough. So I paid attention the second time around, and made sure to comment throughout the show so we were talking about what happened. Bedtime for the Twins tonight. I get Big Bro and Red tomorrow night. This didn’t work out well for Big Bro and Red. They were both crying and clinging to me. Big Bro more so than Red. He is very attached and this forced separation while I am still in the house will be difficult for us. I need to talk to our Child Custody mediator about this. Maybe/hopefully it will get easier for him during the week. 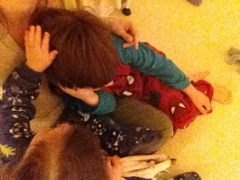 Even Twin Crazy and Twin Husky were consoling him tonight after he barged into their room while I was sitting with them reading a book. So, the 3-day weekend is over, I survived. We divided and I had good fun with both groups of kids; attended a birthday party, went to the zoo, and did normal day-to-day routine things with the kids. Red is asking when she will be able to share a room with Twin Crazy – a “girl” room – I reply “someday soon” and cannot wait to be painting a room pink for my little girls. I have to be patient and know that soon that day will come. It will just be tough getting there.